Did you know that the man who created the first kamus dwibahasa was a British colonial administrator? Neither did we, until a colleague of ours told us it was actually her great-grandfather! While he had spent a major part of his life understanding and writing about these Asian topics, his life began thousands of miles away, in Greece. Note: The information below on Wilkinson's life and accomplishments is based on an article about him by Duncan Sutherland on the National Library Board of Singapore's website. 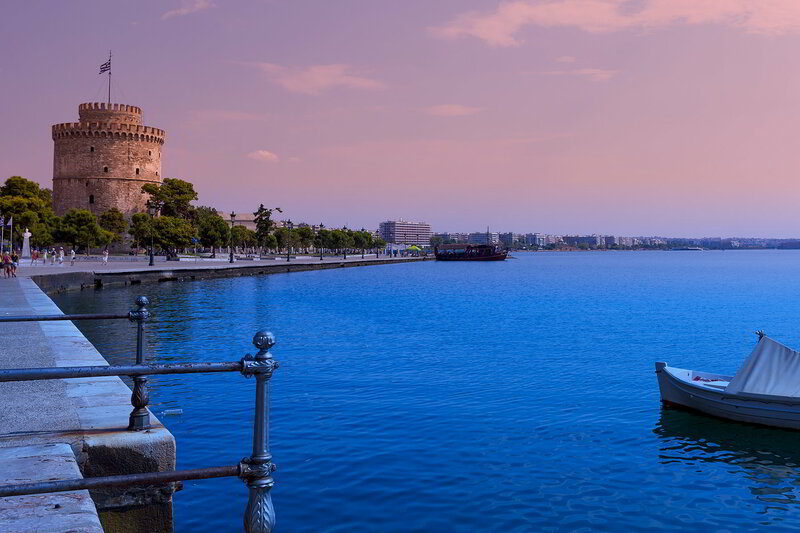 Born to a British Consul in the southeastern European country on 29 May 1867, Wilkinson spent his formative years in Greece's second-largest city, Salonika (now known Thessaloniki) and Malaga in Spain. Wilkinson was sent to continue his education in England to study and went on to further his education at Trinity College, Cambridge. The bright young man was awarded a scholarship in Cambridge. He read history and graduated with a second-class honours degree. Wilkinson was conditionally accepted for appointment to the Indian Civil Service (ICS), but his failure in a required riding test led him to join the Malayan Civil Service instead. It was said that he moved to Malaya in 1889 and held various positions including one as a sheriff and a magistrate in the subsequent years. A few years later, Wilkinson was appointed as the acting secretary of the Straits Branch of the Royal Asiatic Society, to research and document information related to the Malay Peninsula and Archipelago. His contributions to preserving and promoting the Malay language and improving the local education system in the 1900s in Malaya is truly commendable. Wilkinson was a multilingual who was said to have mastered many languages including Greek, Italian, Spanish, German, Malay, and Hokkien. His impressive linguistic abilities led him to create a comprehensive Malay-English dictionary, during his tenure as the acting secretary with the Straits Branch of the Royal Asiatic Society. In order for him to accomplish that, he picked out the words from existing Malay classics such as Hikayat Abdullah, and other Malay literary works from Dutch and English manuscripts. 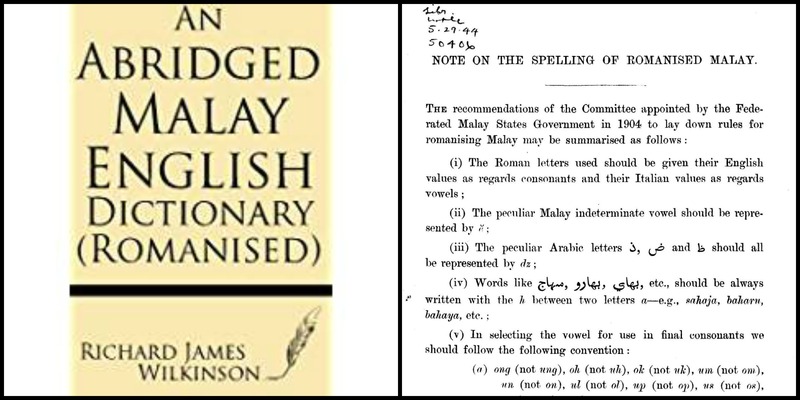 Wilkinson also met and compiled more words with the help of local Malays and tradesmen to check the real meaning of certain jargons or technical terms he wanted to include in the dictionary. The finished version was made into a two-volume dictionary and published in 1901 and 1902, respectively. Wilkinson held various positions in the education sector when he was stationed in Malaya. He was the superintendent of education in Penang, the deputy inspector of schools of the Straits Settlements, and a schools inspector for the Federated Malay States (FMS). To encourage reading habits in both students and teachers, Wilkinson reprinted Malay classics and also opened mini school libraries. 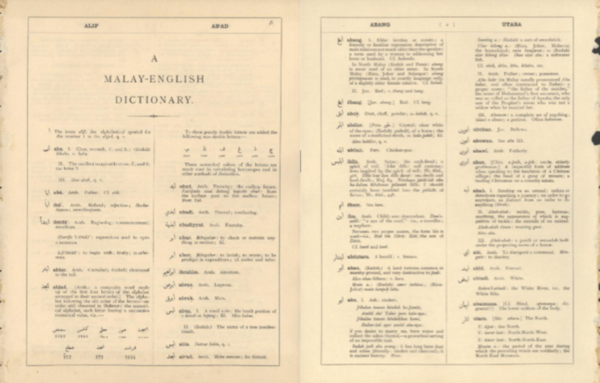 The visionary man also standardised the romanisation of the Malay language to ensure that it doesn't get lost in time and to encourage its usage among the Chinese and Indians. The article by the National Library Board of Singapore on Wilkinson, also spoke about how he was less prejudiced compared to other British officials and was more interested and invested in improving the Malays' education which served as a much needed platform for them to qualify for posts in the Malayan Civil Service. One of his most important and lasting contribution to Malaya came in the form of the establishment of the Malay Residential School in Kuala Kangsar, now known as Malay College Kuala Kangsar (MCKK) in 1905. It is now an elite all-boys school, dubbed by many as the "Eton of the East". 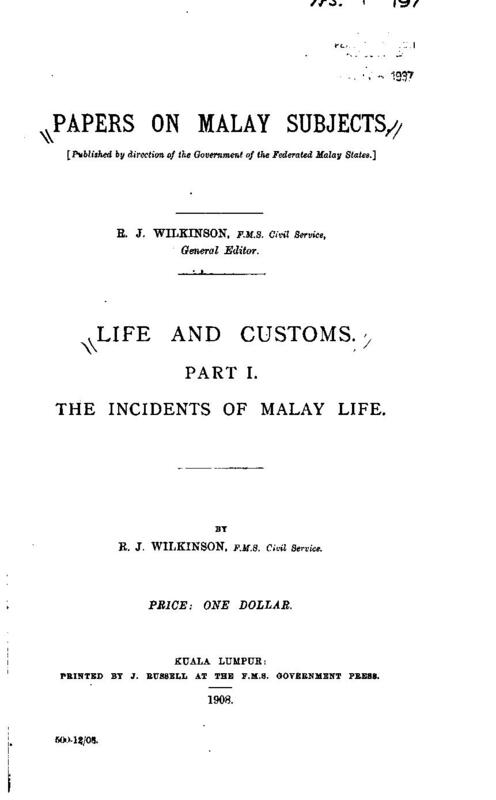 Life and Customs Part 1: The Incidents of Malay Life by Richard James Wilkinson published in 1908. 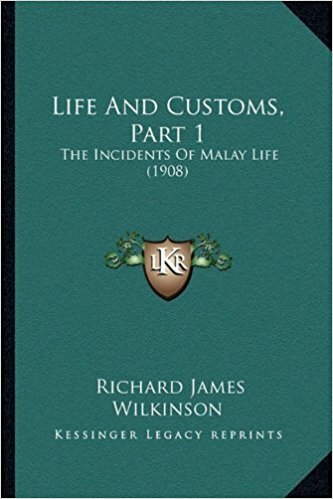 The republished cover of Life and Customs, Part 1: The Incidents of Malay Life (1908) by Richard James Wilkinson. During his time as a deputy to Ernest Birch, the Resident of Perak, Wilkinson worked on a series of papers on Malay topics to help British officials' better understand the local culture and people. Wilkinson was made general editor of the project, known as 'Papers on Malay Subjects'. Some of the topics the papers covered were law, literature, games, the aboriginal tribes and the vocabulary of the lowland Semang people. - A vocabulary of central Sakai (dialect of the aboriginal communities in the Gopeng Valley), published by J. Brown, FMS Govt. Press, 1915. 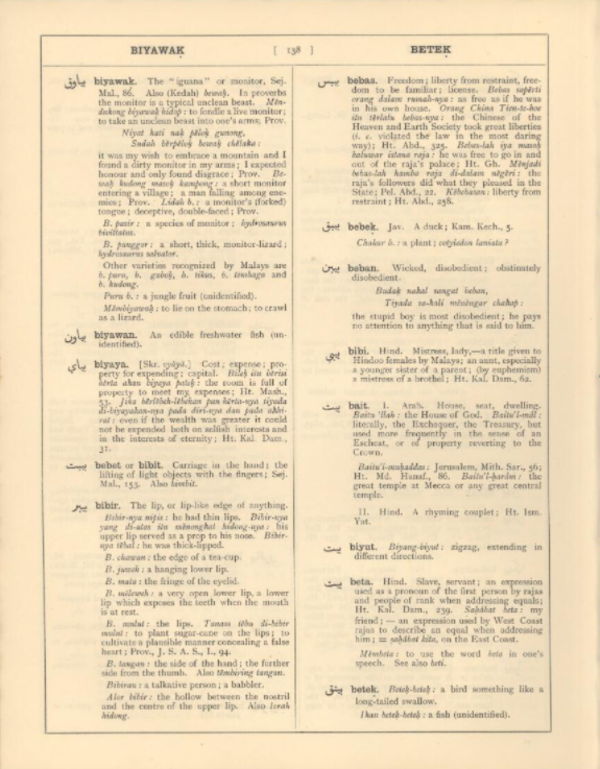 - Malay Beliefs, Published by Luzac & Co, 1906. - A history of the peninsular Malays, with chapters on Perak and Selangor, Published by Kelly & Walsh 192. 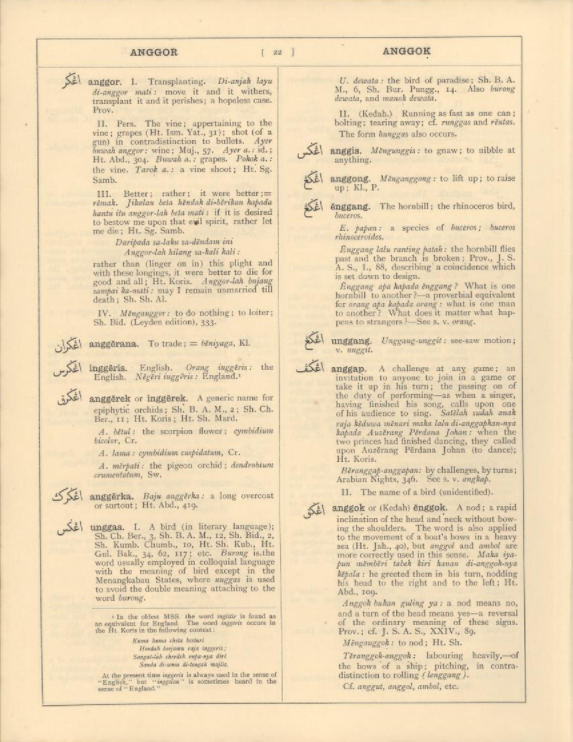 - A English-Malay dictionary, co-authored with Sir. R.O. Winstedt, published by Kelly & Walsh, 1932. - Malay Grammar, co-authored with Sir R.O. Winstedt, published by Clarendon Press, Oxford, 1913. - Papers on Malay Subjects: Law, Part 1-2: Introductory Sketch and the Ninety-Nine Laws of Perak. - A history of Perak, co-authored with Sir R. O. Winstedt and SWE Maxwell, republished by Journal of The Malaysian Branch Royal Asiatic Society (JMBRAS), 1974. Note: Some of these books are no longer in publication or have been superseded, but they continue to be a highly valuable and respected part of the books published on Malay and local culture. During his time in Malaya, Wilkinson also served as the Resident of Negeri Sembilan for a year, from 1910 till 1911. It was said that he also helped to maintain peace and stability in the Straits Settlement after Britain declared war on Germany in 1914, when he was its acting governor. Wilkinson was later appointed as the Governor of Sierra Leone in West Africa in the year 1916. He served there for six years till his retirement in 1922. He spent his post-retirement years in Greece but eventually fled to Izmir (formerly known as Smyrna) in Turkey during World War II. 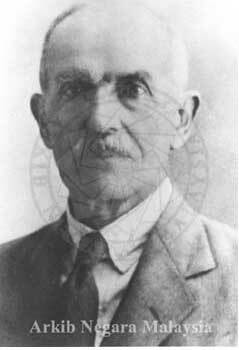 Wilkinson passed away in Izmir in 1941. 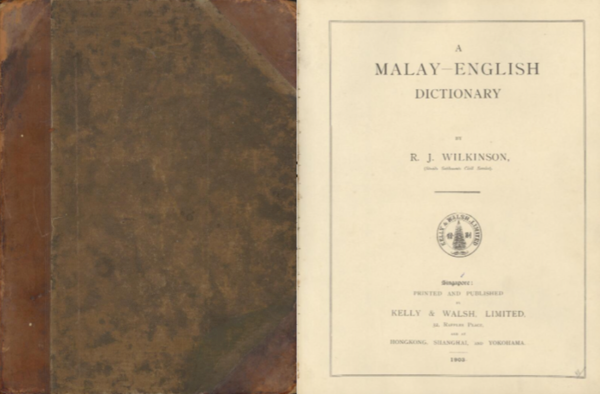 Many may not know of Wilkinson's contribution to life as we know it today - especially for creating the first Malay-English dictionary. Share this mind-blowing history lesson!